Today’s post is something completely different. It’s all about the 16 dogs I recently welcomed into my life. With pictures of all the cuties, of course. 2017 was my first year being a Dog Buddy – hopefully the first of many. 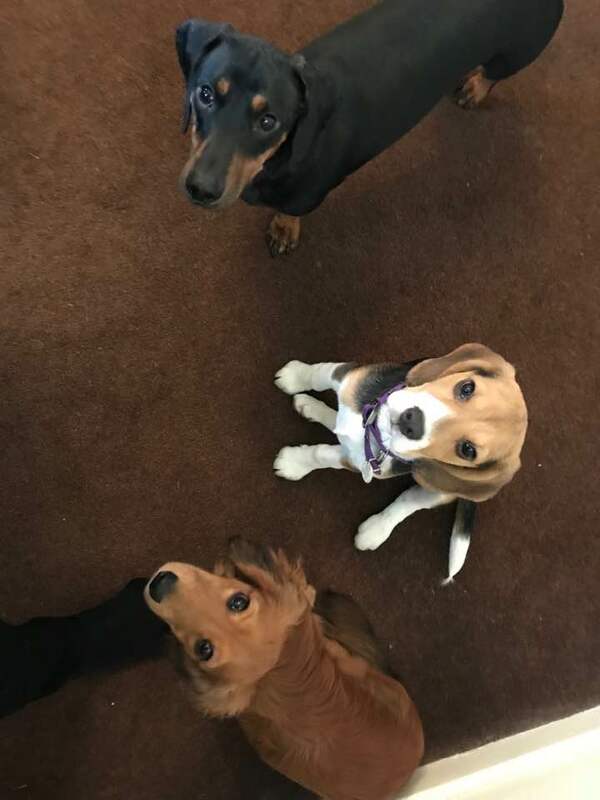 I signed up to their website, dogbuddy.co.uk having passed various tests and – as if by magic – myriad dogs starting arriving. And what joy they brought to our lives. As someone who travels a lot and really can’t have a dog full-time this was the perfect way for me to get my doggie fix. And to fall in love with 16 new furry friends. Luckily I live right next door to a lovely, large park and spent many peaceful hours meandering its pathways and greenness with various doggies in tow. 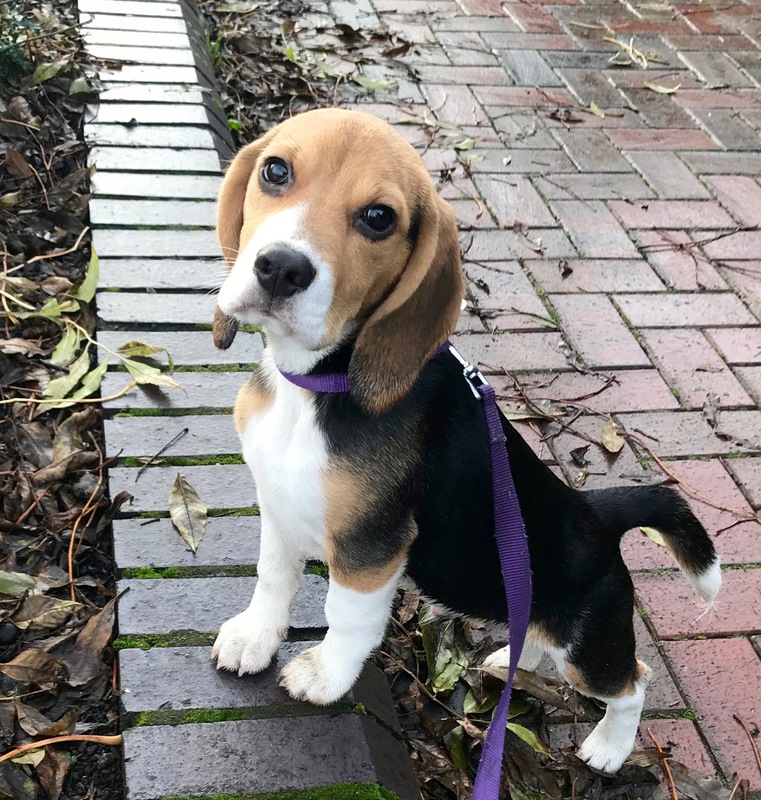 I met literally hundreds of people (funny how random people talk to you when you’ve got a dog), discovered a whole new local society and got to explore new parts of my neighbourhood. Oh and became very adept with dog harnesses, leads and poo bags while learning plenty of other doggie-related skills! Oscar AKA Oskie Puppy Beagle A real show-stopper, this energetic little chap took ages to walk as people kept coming up to chat and pat! Full of affection and with perfect eyeliner, he was also very good on the bus. And I took him once to the pub where unfortunately he did a large wee on the floor as soon as he walked in. Luckily they were all dog lovers and soon forgave him! How could they not? 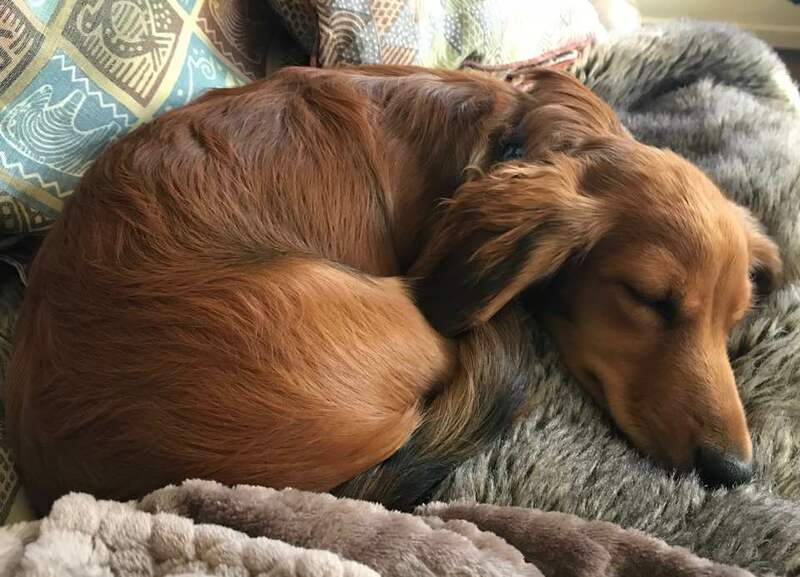 Hank AKA Hanky Panky A five-month-old miniature long-haired daschund who I fetched four times a week for day care. 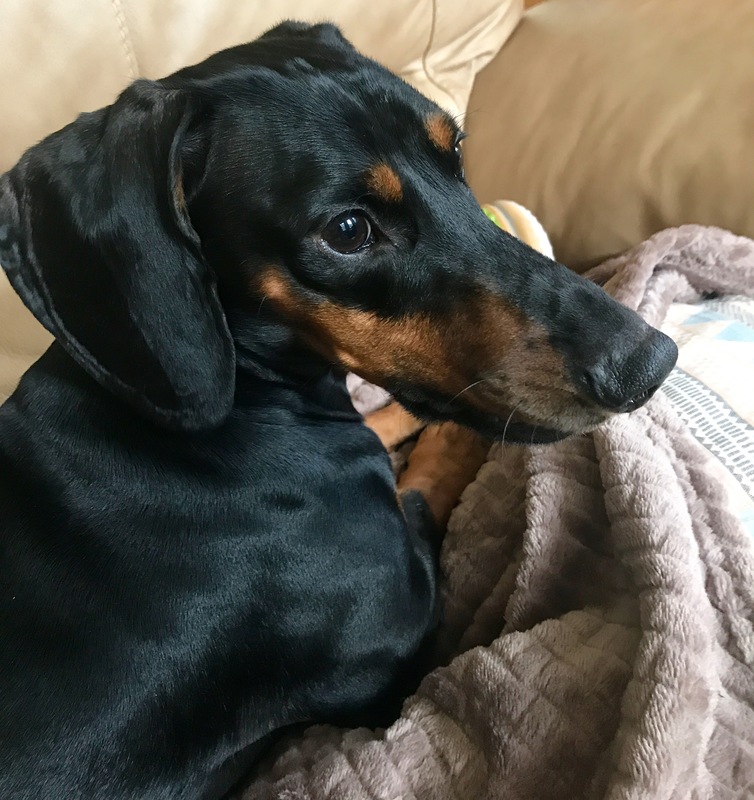 With the softest of fur, he loved cuddling up and doing the Daschund Dash around the garden. 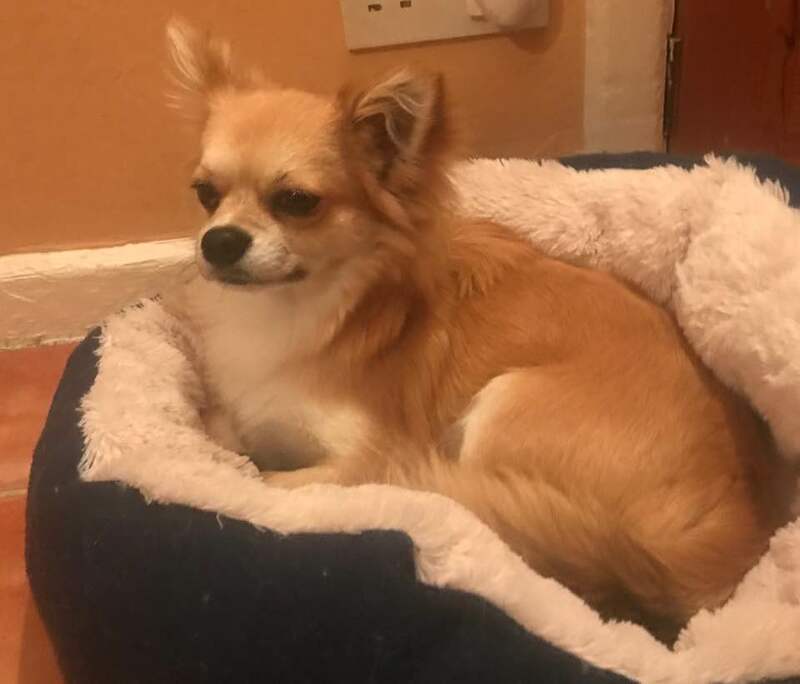 As one of my regulars he also got to make lots of new friends, including Chico who he searched the house for every time he arrived, even long after Chico had gone home. 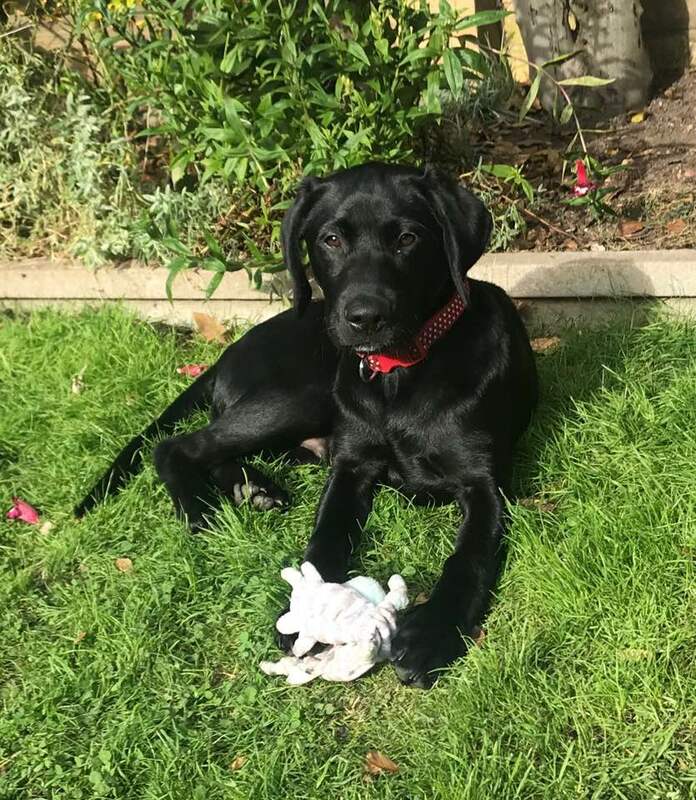 Frank AKA Frank A soft and glossy three-month-old labrador puppy who loved playing with his toys in the garden and was already beautifully trained. He only came for one visit so he’s escaped being labelled with one of my silly nicknames. So far! Hector AKA Hectic Tail Wagger. See what I’ve done there! 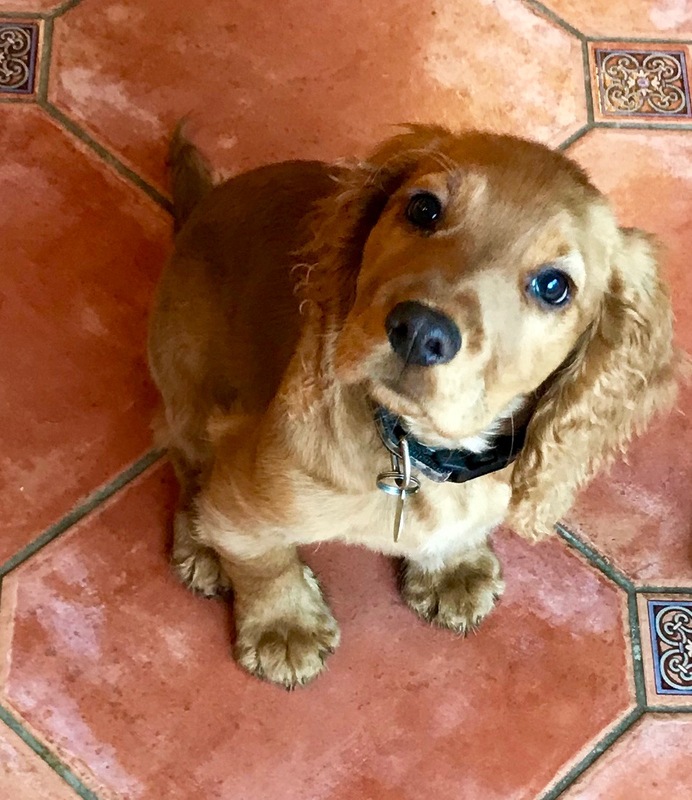 Little Hector the four-month-old spaniel had the busiest tail I’ve ever seen. Not only did he wag it all the time, he did it with real gusto. So cute with his soft, curly ears and big brown eyes, he could play for hours. Before some serious siesta time of course. 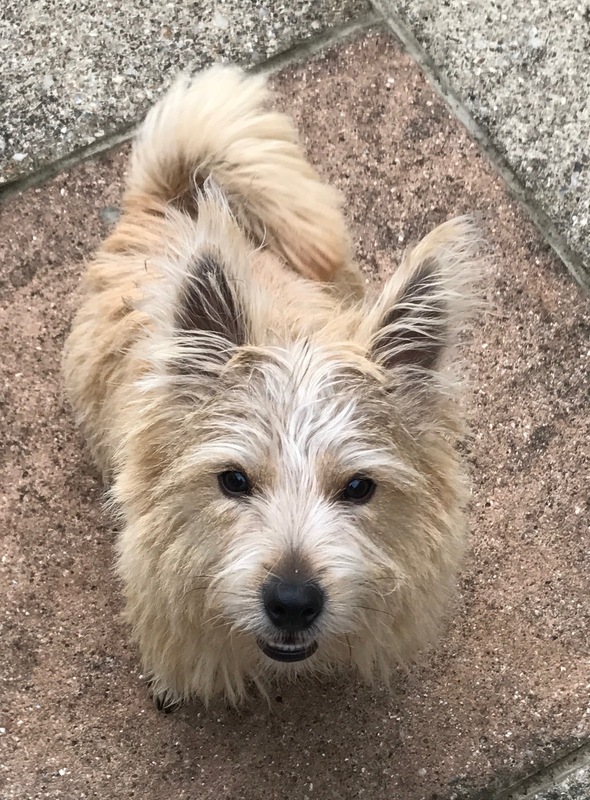 Murphy AKA Murph This beautiful Norfolk terrier didn’t want to come in when his owner dropped him off – I had to carry him into the house. A week later he didn’t want to leave! 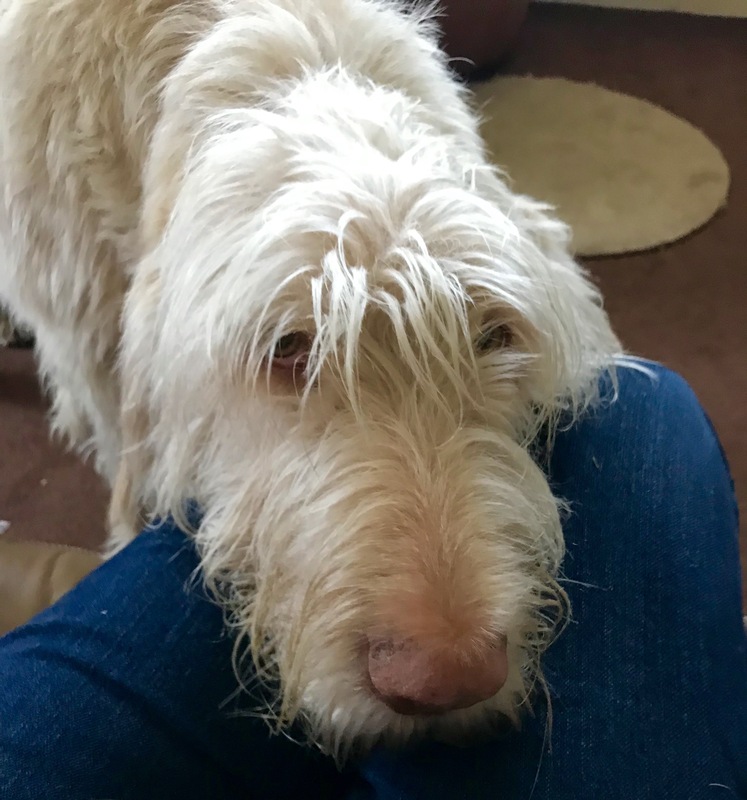 He loved being brushed – would stand there patiently for as long as I could keep going. 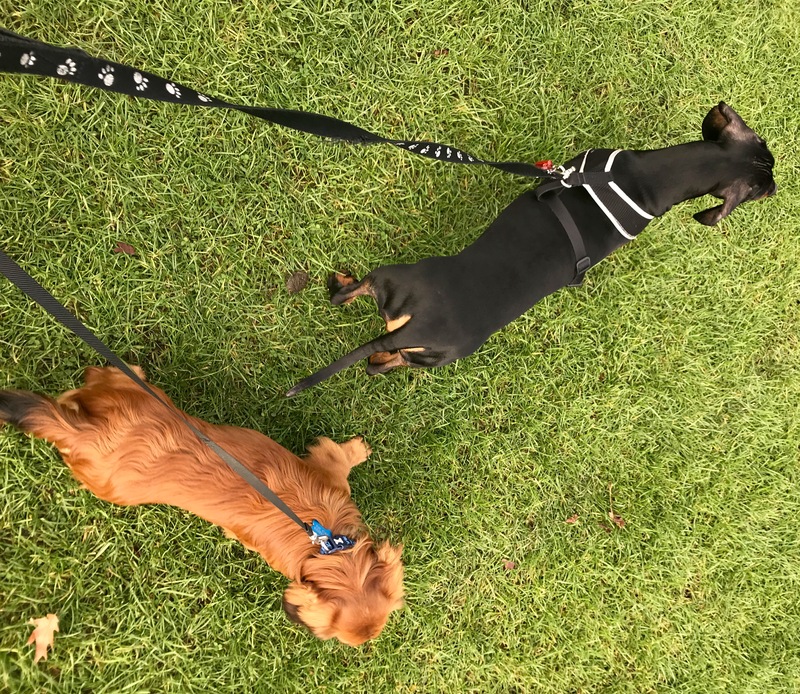 Easy and obedient, and so light to pick up at the first sign of trouble – dog walking in the park can have its perils. 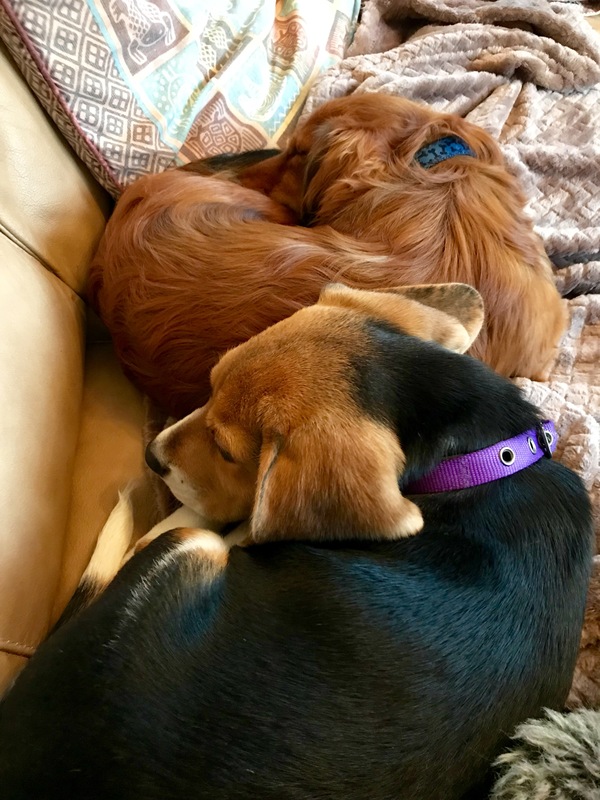 I invited my friend Jules around for dinner with her dogs Coco and Chloe and Murphy fell in love with Coco and spent the whole night trying to charm her – with no luck as it happens. He loved the interaction even so! Murphy also came to the pub with us and delighted in scooting under tables polishing off any food – even vegetables. Chappie AKA Chapplie Chaps Chappie is a glossy short-haired daschund and rather a large one! As a little boy in the park said one day: “That’s the biggest sausage dog I’ve ever seen!”. Chaps came regularly for day care and then for sleepovers when his parents went on holiday. I could hear him coming down the road as he excitedly pulled his owner towards my house. And then he went berserk as soon as he saw us. He’s spent so much time with us he’s firmly part of the family. And gets very protective of me, even barking at his parents when they come to fetch him. Chappie sent me a Christmas card, very impressive, I had no idea he could write! Always on the lookout for any dangers to our home! Chico AKA Cheeky Chi What a sweet addition to our household Chico the fluffy chihauau was. Bigger than your average chi he walks at heel so proudly with his lovely tail held high. Hank also fell in love with him and missed him when he went home. And I even took him on the tube and bus to see my cousin in Notting Hill – he affectionately curled up on her lap. She wanted to keep him! I often bump into Chico with his owner in the park and he runs up to me and gives me a huge hello. 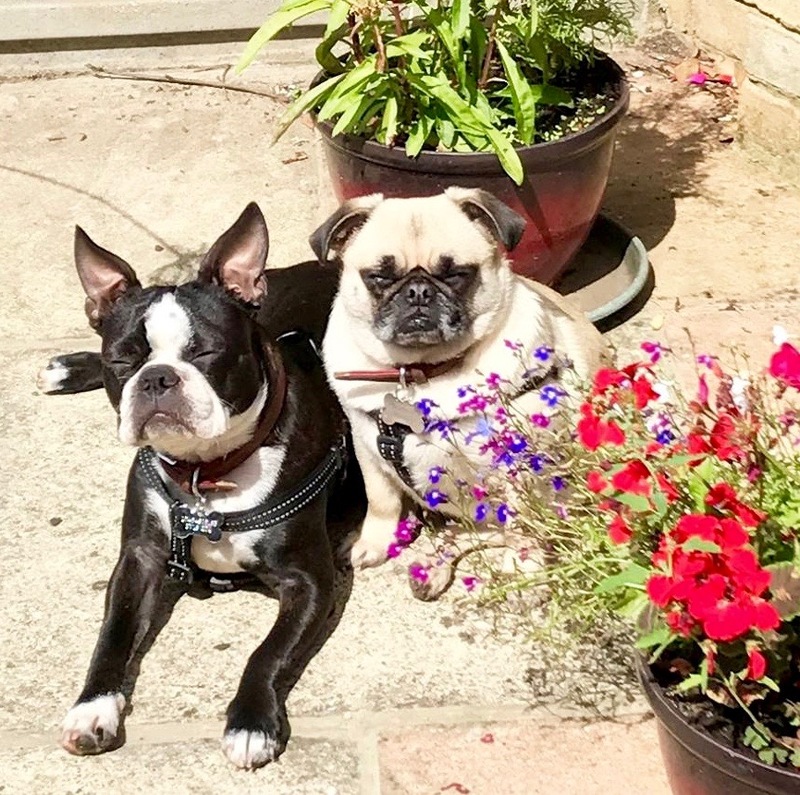 Tilly and Enya AKA Tillytill and EnEn My first-ever staying customers, this pug and Boston terrier had recently moved to London from South Africa. 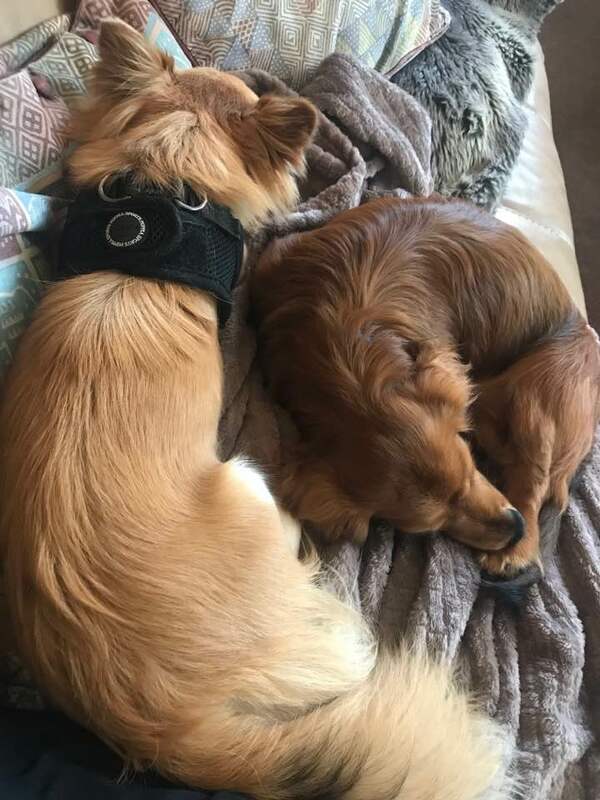 Full of energy and very loving, they both wanted to be on my lap at every opportunity, usually one pushed the other off so they could fit! 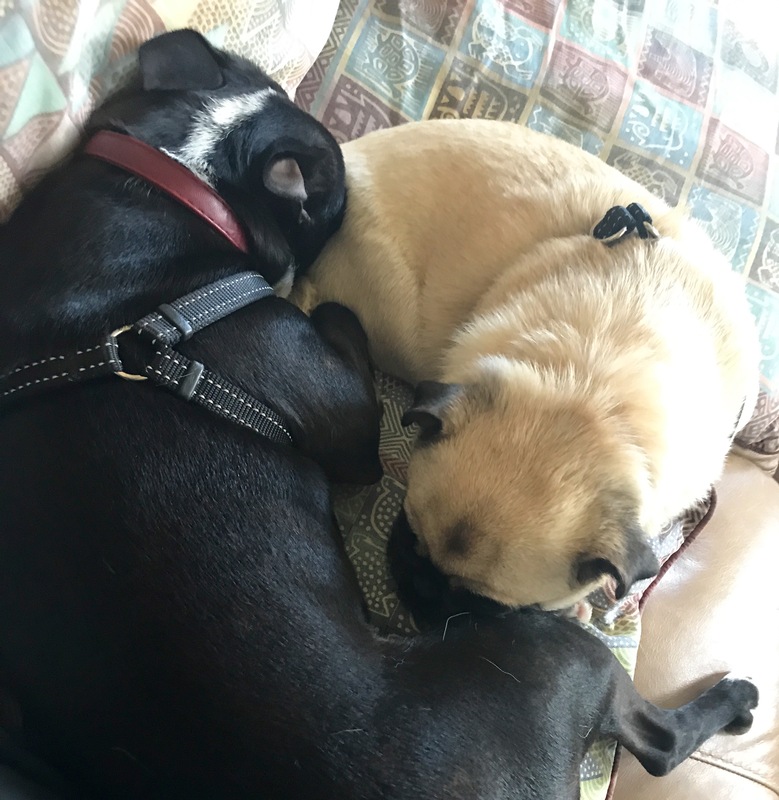 We took them to the pub where they were their usual boisterous selves, jumping on my lap, trying to take over the table and generally endearing themselves to all the other customers. One of whom wanted to buy them! I love how close they are, rarely leaving each other’s side. Feeling the sisterly dog love. 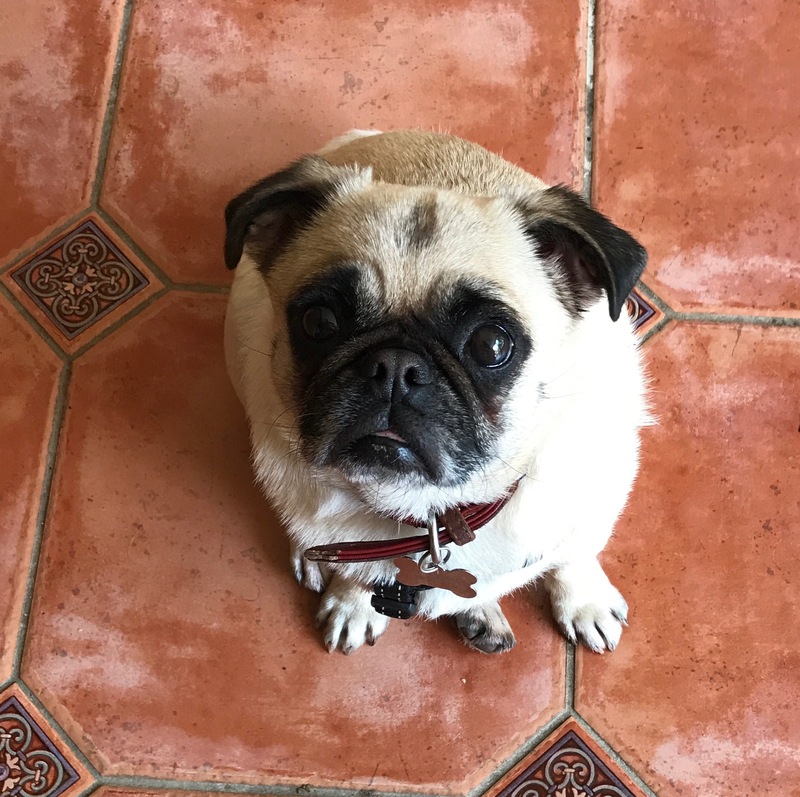 Tilly the pug – who can resist that little face? 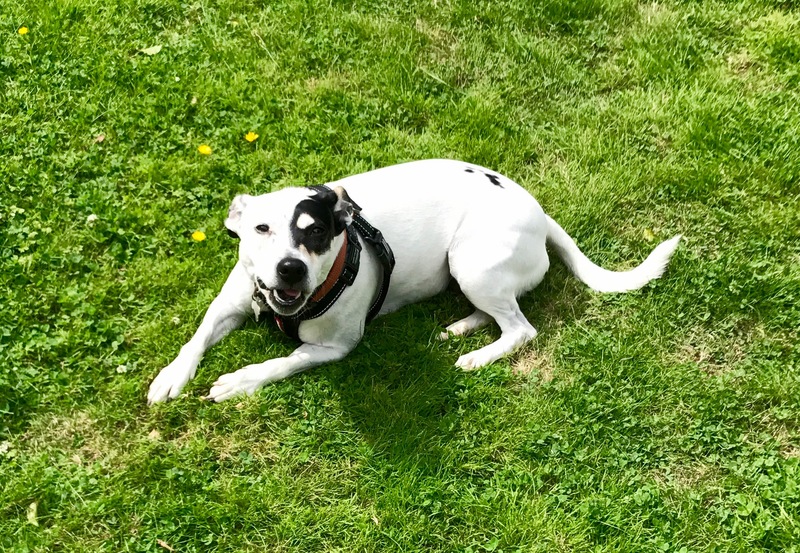 Dora AKA Dora the Explorer My first experience with a staffy – and a superb one. Dora is a real lady. Obsessed with playing with her ball, immaculately behaved and simply a joy to have around. She was also really cool around the other dogs, playing politely and then turning her nose up and walking away when she’d had enough! They all soon got the message. The best-behaved staffy in the word? Probably. Riley and Juliet AKA R&J My second staffy experience! Juliet (great name for a dog!) 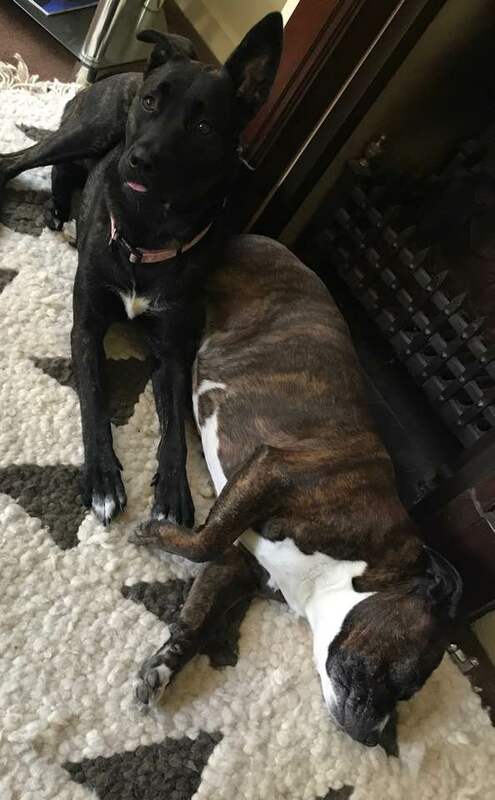 is pure staffy and Riley a staffy mix. These sisters adored their walks – it seemed like they could have gone on forever. Juliet’s one of those really vocal dogs who easily gets excited, even putting her harness on (which could sometimes take a while due to excessive wriggling and wagging) got her squealing. Riley is uber friendly and somewhat exuberant and very gentle too, with one ear that just couldn’t ever really stand up properly. Added to her cuteness. Bella AKA Bella Bell And then there was Bella – another real lady. She’s an Italian Spinone, a breed I had never heard of and quite a bit bigger than my usual visitors. Her owners knew I was concerned about her size so asked me to spend some time with her and the rest of the family in the park. Which I did and totally fell in love with this gentle and playful giant. She easily made friends with other visitors and loved playing in the mud – always leaving a browner shade than she had been when she arrived. 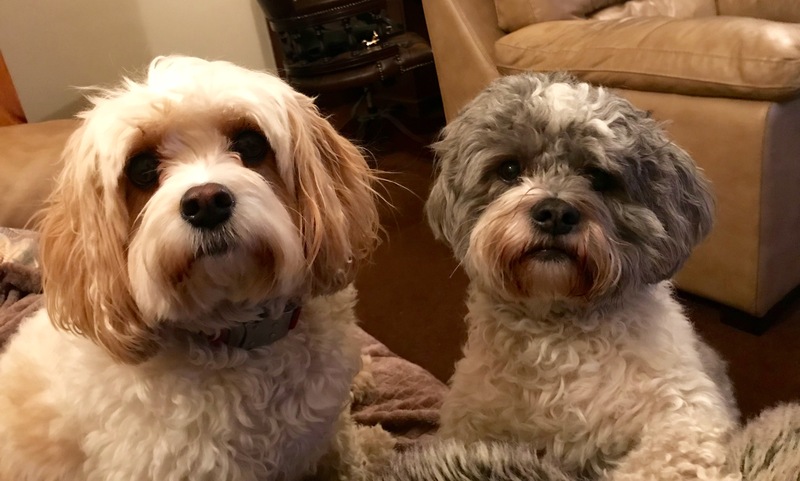 Oscar and Sadie AKA The Easy Dogs These two cuties – Sadie’s a cockapoo and Oscar’s a mixed breed – live together and were the oldest dogs I looked after (aged 6 and 4). They were also the last of the season and I realised then what a lot I had taken on looking after all those pesky puppies. They were laid back, obedient, very cute and absolutely no trouble at all. And they seemed to feel instantly at home. You read so much about dog socialisation and how important it is. And it’s not easy to encourage or control! 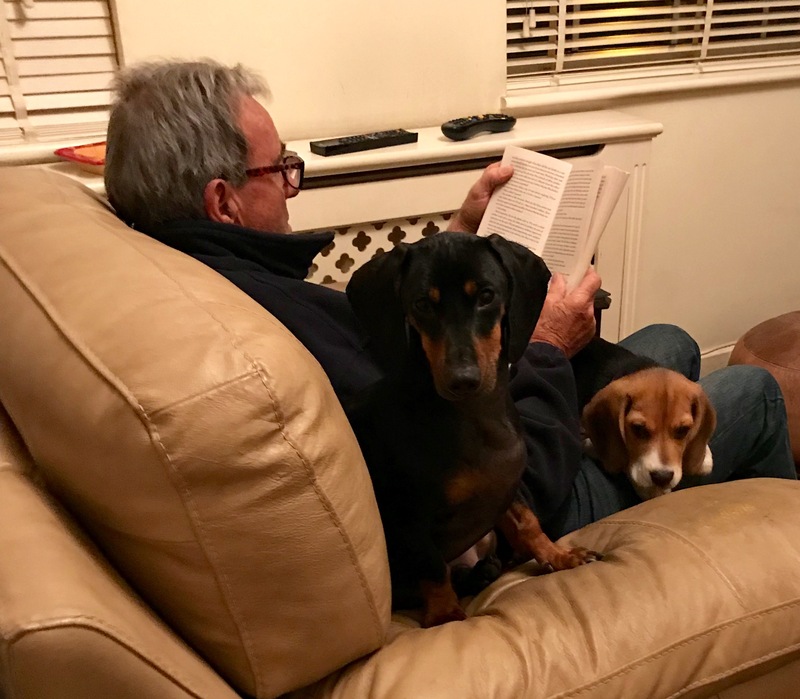 I was often in the position where I had two or three dogs at once who had never met before – something I made sure to clear with their parents before agreeing to the booking. After initial skirmishes, sniffing, barking and some growls generally everyone made friends. Some to a larger extent than other. And they did wear each other out with plenty of chases up and down the garden. It certainly made walking interesting, especially the day I had four all going in different directions! What a wonderful doggie extravaganza that was. There’s no doubt that dogs make life better. All that unconditional love makes you feel a happier person. How I miss them, but I hope I’ll see them soon. In the meantime I’ve managed to borrow a rescue dog to walk at Paws on the Promenade next Sunday 18 February in Sea Point, Cape Town. Anyone want to join me? With or without a dog! 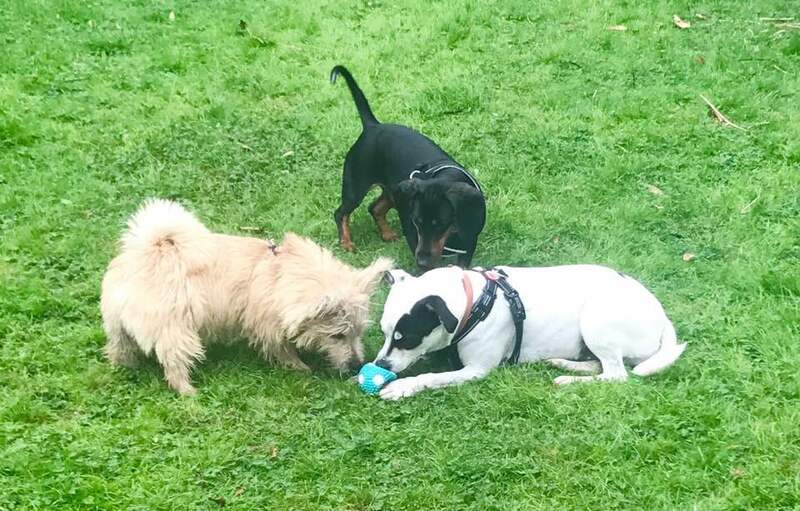 If you’re looking for help with dog walking or sleepovers in London, you can find my profile on dog buddy.co.uk by clicking here. Hi Becky, I remember seeing pictures of Beegu and actually thought about him when Enya came to stay. She is a lovely dog, lots of energy and spirit. So pleased you enjoyed reading it and that you got my email. Let me know your news when you have time.